Interested in growing medicinal and culinary herbs this season? 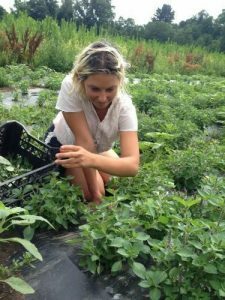 Sawmill Herb Farm is entering our seventh season of growing herbs and we are looking for interns to join us for the 2019 season! Our interns are a vital part of the farm. Interns are involved in many aspects of the farm including: weeding, transplanting, harvesting, irrigation, drying, garbling dried herbs and packing herbs. Most of our work is done by hand – with hoes, rakes, shovels and harvest knives. As a small farm, everyone participates in everything and interns learn directly from the plants and experience. 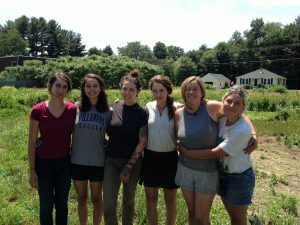 Interns work on the farm 2 days a week every Wednesday and Thursday, from 9 – 4, with a lunch break in the middle of the day. We offer three sessions during the growing season. Interns can participate in one, two, or all three depending on interest and commitment level. Summer: June 26 – August 29. Summer tasks include harvesting leaf & flowers for market and CSA shares, weeding, processing for drying and packing out bulk dried herbs. Fall: September 4 – October 17. Fall tasks include harvesting greens & roots, processing herbs for drying, packing out bulk dried herbs and getting the farm fields winter-ready. 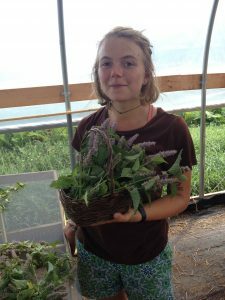 While Sawmill interns are volunteers, all interns receive a dynamic education in growing herbs through direct experience and resources that we’ve hand selected and compiled. Interns have open access to all workshops & events held at the farm and are compensated with fresh herbs chosen from the diverse abundance of plants grown on site. Some colleges offer their students a stipend for unpaid internships, check if yours does. Applicants should be interested in learning about growing medicinal herbs, be energetic, willing to work outdoors in any weather condition, able to work independently and with a crew and be self-motivated. Contact Susan at sawmillherbs@gmail.com. We look forward to hearing from you!